Printed sanitizing hand spray, great for trade shows, outdoor events, travel and anyone on the go! Conveniently clips to your pocket or neatly fits in your purse, handbag or desk drawer. Uses a non-aerosol pump which is safer for the environment. Contains approx 7ml. 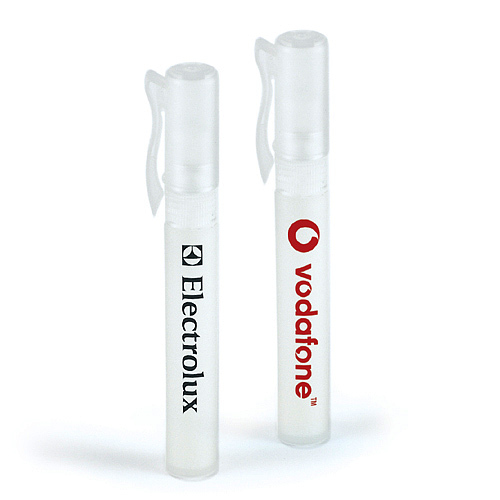 These promotional hand sanitisers come packaged in a transparent (frosted) tube with cap. Available in a great range of fragrances.strawberry (clear), lavender (clear), lemon (clear), ocean (clear), lime (clear), orange (clear).